Just 4 days left! If you haven’t seen it yet, that’s the time you have left. “Hungry for Change” is the sequel to “Food Matters”. 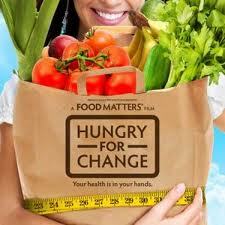 Unlike your fav sequel, you don’t need to have seen Food Matters in order to get the message from “Hungry for Change”. Hungry for Change is free to watch but only up until March 31,2012. Carve out the time, skip the news on tv, heck I even give you permission to skip a workout to watch this. It will be one of the best 90 min investments in your health that you do this week!